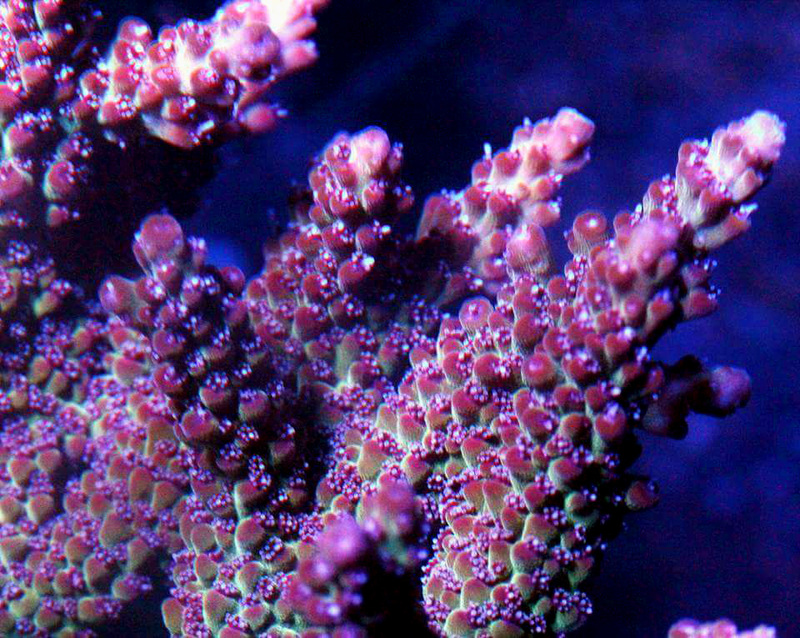 The NR Wonka Berry Acropora is a striking thick branched Acro that also contains some very interesting and unique pigment characteristics. Large and rounded corallites are primarily colored a bright reddish purple or berry-like coloration. These reddish pigments can also fluoresce a pure bright reddish orange when illuminated under black light (UV-A Light)(see image below). 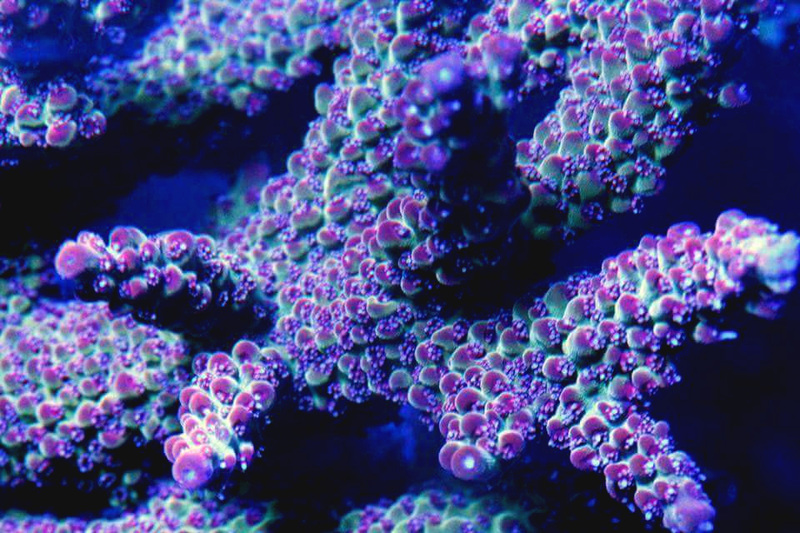 Pigments of this type are unusual for Acropora and are more typical of pigments found within Chalices, Favias and Micromussa corals. The branch stems are colored a bright green under normal blue reef lighting. With Royal Blue LED’s however, this green dominates and develops a striking color contrast between stems and corallites. Reeffarmers acquired our seed direct from Nice Rack during the Texas Coral Fest spring 2016 event. We worked directly with Zach MacDonald from Nice Rack. Zach stated the colony was acquired in September of 2015. Our original seed section was the size of a large fragment and Reeffarmers broke that down into three small fragments. One small fragment is our seed (imaged at bottom) and two others are the Third and Fourth Edition fragments. Reeffarmers is maintaining a seed section of this coral in a 8 foot Raceway Gyre BiZonal system. This system is naturally filtered with a semi-cryptic zone and a reef flat exposed zone. In this captive reef the coral is positioned to receive moderate to strong light and moderate water current. The first edition fragment of this coral was sold through Reeffarmers at the Texas Coral Fest spring 2016 to Jerry Harrison. The second edition fragment of this coral was sold through Nice Rack also at the Texas Coral Fest spring 2016 to Jimmy Tran. Recommended list price on April 8th 2016 was $150 for a small sized fragment.